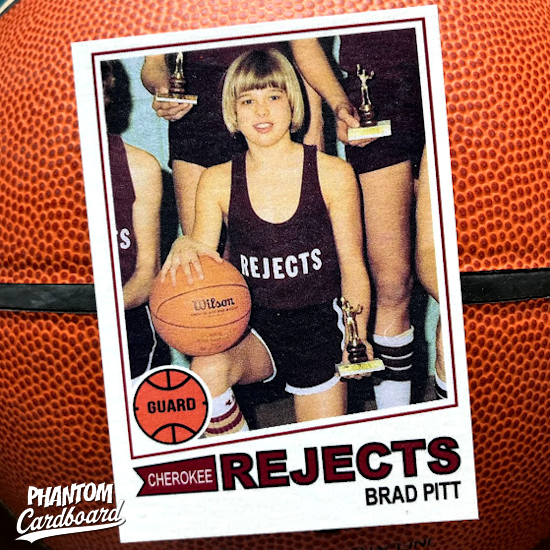 Chances are if you’ve bumped around online enough you’ve come across the photo of a 14 year old bowl-cut Brad Pitt in basketball jersey that reads “Rejects” holding a little trophy that surfaced some years back. Well, there’s a pretty fun backstory to that image. Brad didn’t make the cut for his Springfield, MO eighth grade basketball team in 1977 so he banded together five other kids that also failed to make the Cherokee Middle School team and they started their own team with Brad’s dad coaching them. Brad came up with the tongue-in-cheek name Cherokee Rejects. It wasn’t so much that he was disgruntled about not making the school team, young Brad just wanted to hoop. The team would practice at a church the Pitts attended and played their games at the local Boys Club. I couldn’t find any recollection as to what the little trophies were for. Persistence paid because I read that Brad did make his high school team, and then went on to do other stuff in life too.